The good news is that getting vaccinated is easier than you think. Adults can get vaccinated at doctors’ offices, pharmacies, workplaces, health clinics and health departments. Visit vaccinefinder.org to help find a vaccine provider near you. Most health insurance plans cover the cost of recommended vaccines—a call to your insurance provider can give you the details. Traveling overseas? There may be additional vaccines you need depending on the location. Find out at https://wwwnc.cdc.gov/travel. Still not sure what vaccines you may need? The CDC offers a short quiz at www.cdc.gov/vaccines/adultquiz to help find out which vaccines you might need. You can take the results of your quiz to your provider to discuss which vaccines are right for you. All adults should get an annual flu vaccine to protect against seasonal flu and a Td vaccine every 10 years to protect against tetanus and diphtheria. 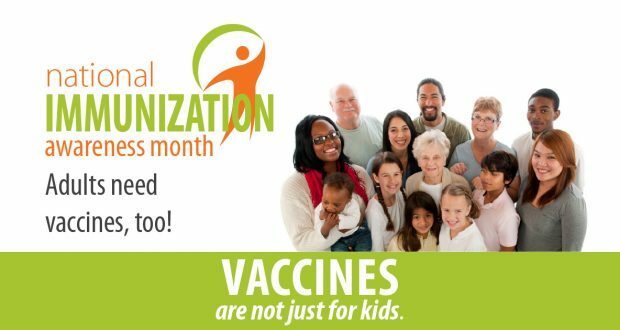 You may also need other vaccines based on your age, health conditions, occupation and other factors. If you are planning to travel outside of the U.S., check on any additional vaccines you may need. Some travel-related vaccines are part of a series or are needed months prior to your travel to be most effective, so be sure to plan ahead.